I have found that most people, particularly those starting out in the horse industry, own an all purpose saddle at some stage in their riding career. These saddles cause a great deal of riding problems with position and balance. They place the rider in an armchair seat, with the hands buried low on the horse's wither just in front of the pommel. The lower leg flops around uselessly and is unable to engage to give correct aids. 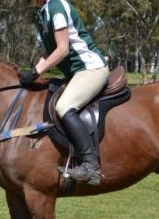 The hands and arms are locked in positions and are unforgiving and ineffective, see picture to the left.When a rider learns to ride in an all purpose saddle, it creates terrible ingrained bad habits that can take years to fix. The solution to this is to avoid all purpose saddles and only use saddles designed for your chosen riding disciplines. 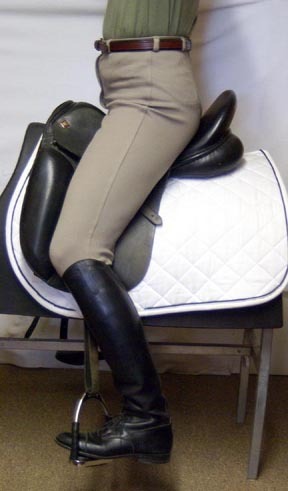 A dressage saddle with its long straight flaps and deep seat places the rider in the correct position for any non-jumping riding and dressage with the shoulder, hip and heel in alignment (see picture below), and is also fine for trail riding. A jumping saddle with its flatter seat and forward cut flaps naturally encourages the rider to sit in a relaxed two point seat with forward soft hands allowing the horse to move and jump freely. The toe, knee and shoulder should be in alignment as seen in the picture below. When venturing into the horse industry or considering the purchase of a new saddle, consider the reality of which disciplines you will be partaking in. I recommend all new riders purchase a dressage saddle to learn in, as it will place you in the correct position from the beginning, preventing any bad habits. It will be some time before you need to do much jumping, and if or when that time comes, you may consider purchasing a jump saddle. If you are already involved in both dressage and jumping, I recommend saving more money and waiting a bit longer and purchasing both decent used jumping and dressage saddles, rather than splurging on a new all purpose. It should be noted that the correct riding positions for dressage and jumping are distinctly different, as can be seen from the above pictures, and saddles designed for these specific disciplines assist the rider to naturally sit the correct way. These differences in riding positions will be covered in another article. You cannot merge these positions by using an all purpose saddle. There is a reason the slang term for all purpose saddles is 'no purpose saddles! 'The appropriate saddle for your discipline combined with lessons with a quality coach will have your riding ability progressing quickly and preventing and eliminating any bad habits.